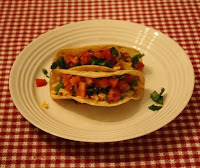 Okay, my non-cooking friends, here's an easy one: vegetarian tacos. This is a staple at the Freed farm. Prep: Wash and dice roma tomatoes. Add to medium bowl. Mince some onion (to taste- I usually use a couple thin slices/rounds) and add to tomatoes. Dice and add a jalapeno. I leave the seeds in for heat, but if you don't like too much spice, you can remove. Wash and trim some cilantro. I like to use a lot, and its easiest to cut up into little pieces over the bowl with kitchen shears. Add some garlic, salt and pepper, garlic salt if you have any, and lime to taste. Mix all together and adjust to taste. You'll want to make a little while before you plan to eat and refrigerate since it takes a little while for the flavors to mix and absorb. Set aside a large plate covered with paper towel to hold the taco shells as they come out of the grease. Use a small pan for the oil. Pour in about a 1/4 inch vegetable oil (should look deep enough to cover a tortilla). Medium-high heat. You'll know its hot enough when you dip in the edge of the tortilla and it starts to sizzle. If it starts to look too brown really fast your heat is too high. Use tongs to dip the tortilla half way in the grease, keeping the other half at a 90 degree angle. When it starts to firm up, hold it with tongs by the brown side and do the other half and reducing the angle to about 60 degrees. Taco shell-ish. You just want it to be big enough to pile on all the good stuff. I usually make 2 per person. They should be crisp, but not falling apart, and not chewy.